Personally designed by Carlos Ott, the Penthouse at Echo Brickell is the only residence occupying the upper floors of this iconic building. Featuring a two-story layout with breathtaking views of Biscayne Bay, the Atlantic Ocean, and Downtown Miami. The residence offers direct elevator access 524 sqft foyer, an indoor 26-foot lap pool, private gym, sky garden, and 1,209 square feet of 8-foot deep terraces. Interiors feature 23-foot ceilings, with floor-to-ceiling windows, marble flooring, 7-foot Italian entry doors, and Poliform kitchen cabinets. The building has full concierge services. Echo Brickell is an innovative, contemporary tower at the epicenter of Miami x2019;s fastest growing metropolitan neighborhood. 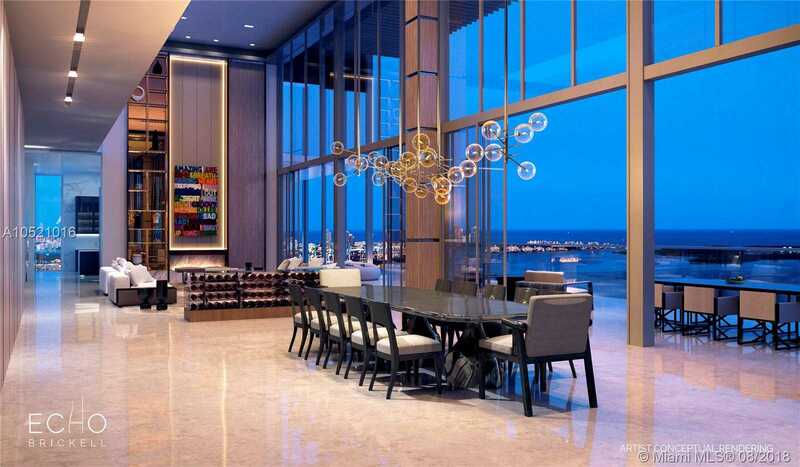 Please, send me more information on this property: MLS# A10521016 – $37,000,000 – 1451 Brickell Ave Unit Ph1, Miami, FL 33131.